Another excellent case for the LushOne described by Sholto on Instructables. The project work that people do on top of the basic LushOne kits continues to be a delight! I get asked quite often about how I approach video bending projects, so here are my thoughts. Because I am trained as an electronic engineer my approach is theoretically and technically driven as opposed to the experimental approaches that other people may use. I find this works particularly well with video bending because you need to retain the structure of the video signal if it is going to display properly. When starting out on a project the first thing I do is to find all the documentation I can about the unit. If I can obtain schematics or service manuals then these can be a great help. For an interesting unit I am happy to buy service manuals if they are not available for free because it saves so much time and hassle. So far it has always been a good investment. If I do get hold of good documentation then examining the circuit will often give me ideas about how things might be modified. Basically I am looking for places where key signals, like the separate RGB colour levels, can be intercepted and modified. There is more discussion on that below. If I don’t have a good manual then I will look at the circuit on the board and try and reverse engineer the key parts. This normally starts with identifying the main chips on the board and through the datasheets and knowledge of the normal operation working out how the signal flows through the circuit. Once you get an idea of the signal flow then you can start to focus in on areas that seem to offer the possibility of modification. Finding bending opportunities is partly science, partly art and partly gut instinct. You want to find a signal or processing function in the circuit that is amenable to modification. A composite video signal consists of the video information (luminance and colour) combined with synchronization information (horizontal and vertical). In most cases you don’t want to over-distort the synchronization information because this will prevent the signal displaying. Finding opportunities to just modify the video information is important. For the video signals then a lot of units will separate video and sync information internally. If you can pull out pure luminance, hue or RGB signals from the circuit then you can make these available to process and distort through other circuits without damaging the synchronization. Just additively mixing in audio or other video signals on top of a video signal can be interesting. Some, cheaper, circuits don’t separate the video and sync information and it can be hard to bend the signals for these. Many video mixers also contain various gate signals that control how different parts of the same picture are processed in different ways. These are used to implement things like wipes and colour fills. 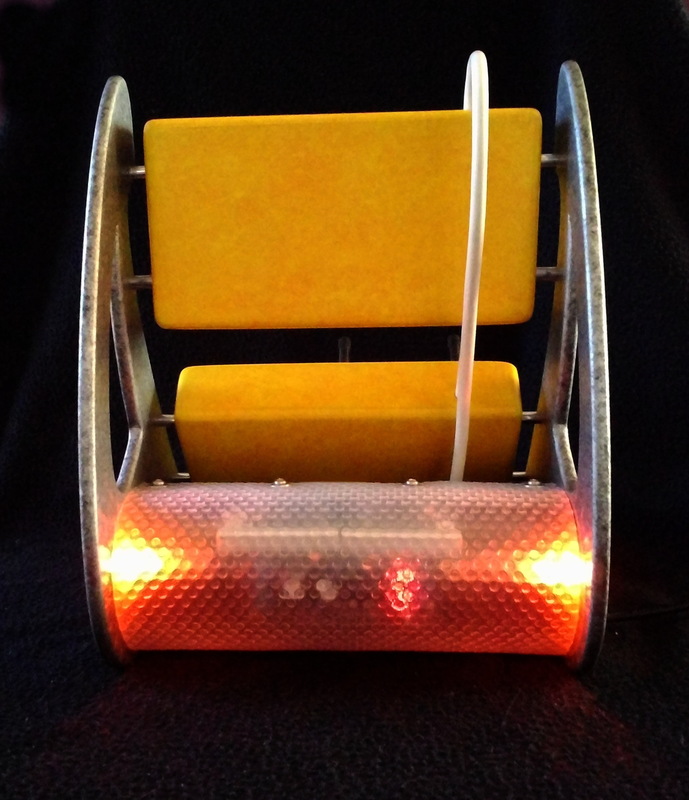 Pulling out these gate signals or being able to inject new gate signals can create fantastic effects. 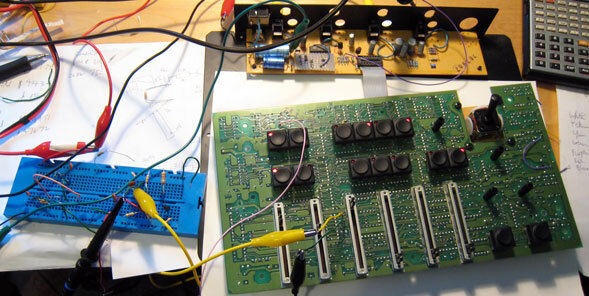 Try xoring two gates from different mixers together and then injecting the result back in to the original circuit. As well as going after the signals you can go after the processing functions. A simple trick is to modify the circuit to remove the limits on how strongly a processing function affects a signal. For example if you have a circuit that controls the colour saturation then it might be possible to boost the gain of this beyond what is intended and create super-saturated and unstable colours in the output. Another thing I like to do is to see if it is possible to replace manual controls with control voltages. In this way you can sweep control values rapidly, even within one frame of a video, under the control of an external circuit. A lot of effects just come from feeding an audio signal in to a control voltage that varies some aspect of a video signal. Intellectually I find it more interesting and more satisfying to work with primarily analogue video equipment, but I guess I should add a word on digital equipment. In circuit bending on digital circuits a common technique is just to ground certain address or data signals so that the circuit starts to misbehave. The results are unpredictable, but fun. This approach carries quite a high risk that the outputs of the digital circuits will be damaged as they try and drive a grounded signal “high”. I suspect this is the cause of a lot of equipment damage caused by circuit bending attempts. One reason you can get away with it on some older equipment is that they used NMOS logic. A feature of NMOS is that it has no active pull-up device (just a resistor) so grounding the output is acceptable. People often ask me if I have ever blown anything up while circuit bending. So far the answer is “no”. I think this is largely because I am normally working with a reasonably good idea of how the circuit is meant to operate and I understand what common electronic circuits will and won’t tolerate being done to them. However, circuit bending is a full contact sport. If you can’t tolerate the risk of destroying what you are trying to bend then you shouldn’t have opened the case. Personal safety is your responsibility. My very strong preference is to only work on equipment that is powered from a low voltage source or, if it has an internal power supply, where the high voltage elements are fully protected against accidental contact. I recommend you don’t work on designs where high voltage components might be touched. Older equipment will contain lead, and possibly other unpleasant chemicals. Always take appropriate precautions including through hand-washing before handling food. I don’t know how much it is possible to teach circuit bending. Particularly with video it is a black-art and relies heavily on experience and luck. Hopefully these hints will help those that want to give it a go though. With a lot of old analogue equipment being sold cheap just get something and start exploring. 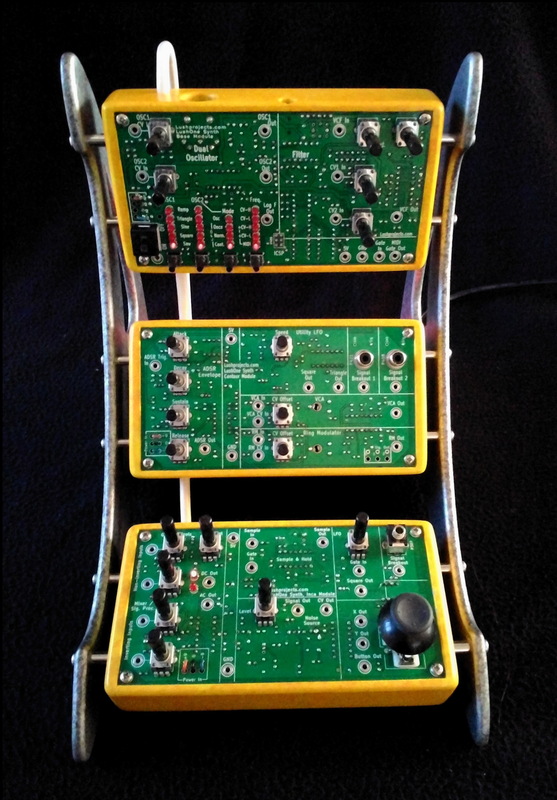 One of the joys of running LushProjects is seeing some of the imaginative work that people put in to building cases for my circuits. Recently Azymbol from Belgium sent me some photos of his LushOne system case which breaks new ground in design and craftsmanship. Working in MDF and recycled materials including placemats and tennis ball tins Azymbol has created a design that evokes 60s futurism displaying the controls to maximum advantage on a dramatically curved frame. The colour is applied in acrylic paint and creates carefully judged dramatic contrasts. 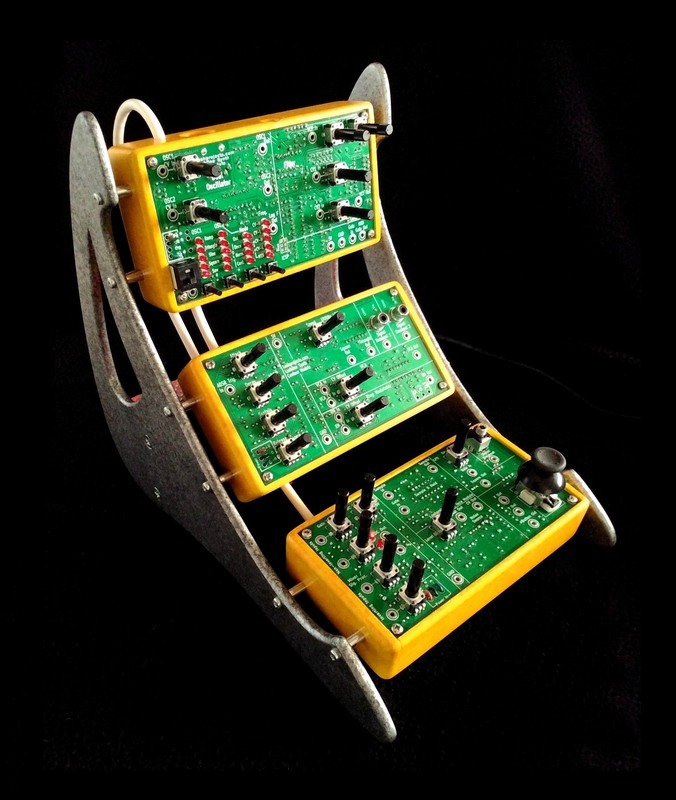 Technically Azymbol has used the LushOne base, Contour and Inca modules to build the synth and a Velleman P8042 symmetric power supply he sourced himself. The design and build are magnificent. Bravo! LushOne Base – What should we have in revision 2 firmware? I’ve been prototyping some new firmware for the LushOne base revision 2. I am using my experience with the original to add features that make it easier to create an even bigger variety of sounds and to use the LushOne as a serious instrument. I also wanted to add features that would help with building the LushOne in to bigger systems. Settings memory so that selections are saved when the LushOne is powered off. LushOne will return to its previous state allowing you to pick-up from where you left off. Three new waveforms for the oscillators. 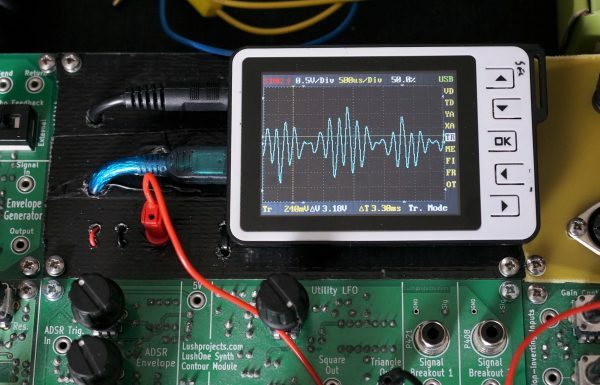 30% and 15% duty-cycle square wave and combined saw/square (like the MiniMoog). New base sounds enhance the range of capabilities. +/- One octave settings for OSC2 in OSC mode. Get really rich, deep tones when mixing with a LushOne Inca. Selection of MIDI input channel for use in more complicated MIDI systems. Ability to get MIDI velocity output as a control voltage (substitutes for the “log f” out). Allows for touch sensitivity. Once the LushOne had a fairly complete set of basic synthesizer functions available I always intended to built a powerful multi-oscillator and multi-filter system. You may laugh, but in the back of my mind I had the brief-case sized systems built on the boutique Mattson Mini Modular components. 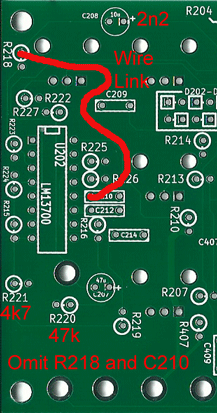 Omit R218 and C210 and instead link the two footprints with a wire as shown on the left. Change the value of C208 to 2.2nF. This is the same value as C210 so you can do a substitution there. Obviously this capacitor is now non-polar so ignore the polarity markings on the PCB. That’s all there is to it! Sit back and enjoy some new sounds. Generally the low pass filter is more useful so if you only have one LushOne Base then I wouldn’t make this a permanent change. However if you want to build a system with more than one LushOne base, or if you want to take the LushOne Base schematic and build your own filter on vero-board then it’s well worth having a high pass option. If you are using both the filters I recommend putting the high pass first in the signal path and then the low pass. This will reduce the risk of any high-frequency noise getting though in to the output. 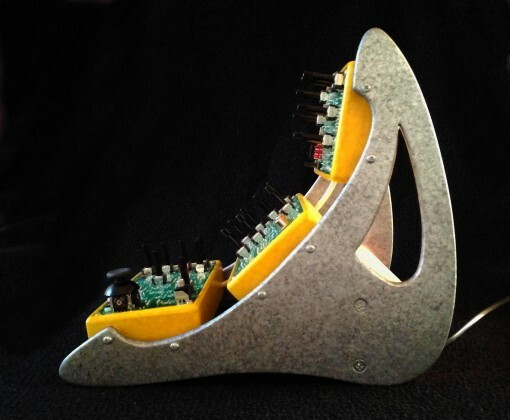 This arrangement can produce quite natural sounding instruments from the LushOne oscillators. Remember that with both a high pass and a low pass filter it is rather easy to cut the signal off all together by having non-overlapping filter bands! I can never find on the web or in my text books the general equations for op-amps used as combined multi-input summing and difference amplifiers (ie they have several positive and negative inputs). It makes designing mixers for synthesizers annoyingly awkward as I have to rederive the equations each time. So, to save myself having to work everything out from scratch again, here are my derivations and notes on multi-input Op-Amp circuits. I will also take the opportunity to point out some interesting parts of the results. We have an op-amp circuit with “N” negative inputs and “M” positive inputs as shown above. All the positive and negative inputs are identical. 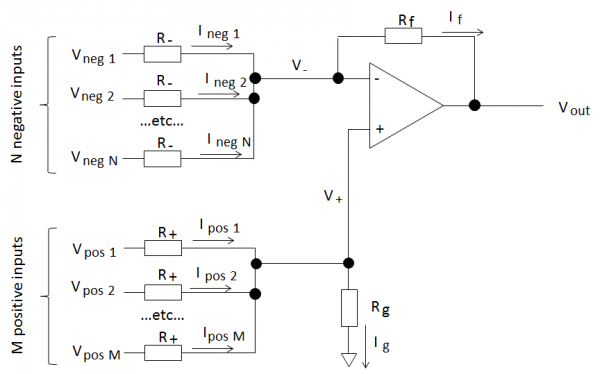 The negative gain is nice and easy and only depends on the input and feedback resistors and not on any other variables, like the number of inputs. Why is this? Well the inverting input of the op-amp is a virtual ground and the voltage isn’t changed by the negative inputs. Therefore the current through each negative input only depends on its input voltage. You can have as many or as few negative inputs as you like and it works the same. The positive inputs are not in this lucky position! Voltages at the positive inputs change the voltage at both the inverting and non-inverting inputs of the op-amp. The non-inverting input voltage changes because of the voltage drop over Rg. The inverting input voltage changes due to the feedback action of the op-amp keeping the input voltages ideally identical. This means that currents flowing through all the input branches depend on the positive input voltages and hence the complicated positive gain equation. If the negative gain G- > 1 and number of negative inputs N < M, the number of positive inputs then G+ < G-. To derive this then consider that the maximum positive gain is when the input resistors R+ = 0 (obvious from the circuit and also by inspection of the equation). There are several interesting special cases from these equations (including the basic op-amp single input amplifiers) and the derivation is worth reading. So I don’t fill the blog with equations you can read it all in this pdf file. 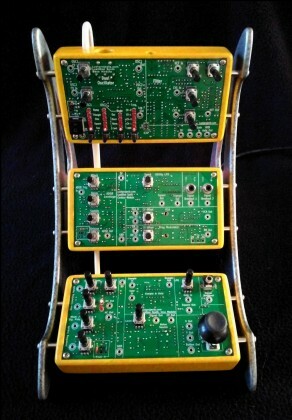 The last few weeks I’ve been busy working on the third module for the LushOne synth. This module is going to be all about signal processing and noise effects. Four channel mixer/signal processor – combine CVs or audio signals within the LushOne or change signal levels for compatibility with external equipment. All this packed on to the same size board as the LushOne base and the LushOne Contour. All the circuits are prototyped on breadboard. 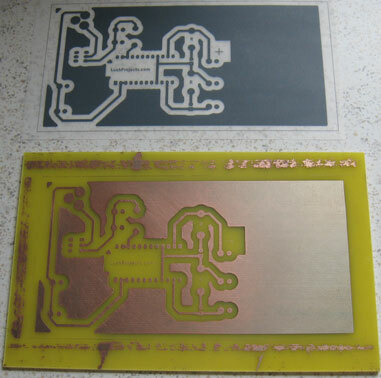 Just finishing the first PCB layout over the next few days. Suggestions for a suitable name for this module are welcome.